In this fast pacing world brought about by sudden changes and improvement in technology, no wonder that everything we do, may it be on our daily activity or other stuffs, there is always a way that technology finds for us to make our life easier and better, under less effort and hassle-free way. Nonetheless, even the gadgets we are using today, no matter how advance it is, there are still ways of improvement that are shown on these items, like the rise of wireless charging of our phones and gadgets. What is wireless charging? Wireless charging is typically the inductive transfer of power from a power outlet into a device without any physical means of connection or using any cable. It makes use electromagnetic fields to safely conduct the transfer of power from a transmitting device into a receiving device, in the easiest way possible. Many may be very curious on how this system works, no how the transfer is done yet no physical attachment was being created. Here is how this works effectively. Wireless charging works as it is based on an inductive charging wherein power is created through passing an electrical current in two coils for it to create an electromagnetic field. When the magnetic plate which receives the current in the mobile device gets into contact with the transmitter, the magnetic field creates and produces electric current into the device. The transferred current is then converted into direct current (DC) which is the one that charges the built-in battery. 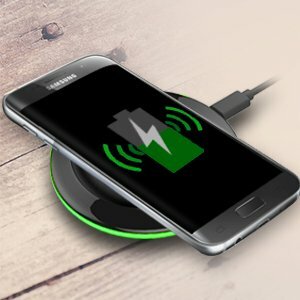 Here is a more detailed way for wireless charging. Main voltage is being transformed into a high frequency alternating current (AC). The alternating current (AC) is then directed to the transmitter coil by the transmitter circuit. The alternating current then tempts a time varying magnetic field in the transmitter coil. The magnetic field creates current within the receiver coil of the device. The process where energy is diffused between the transmitter and receiver coil is also denoted to as magnetic or resonant coupling and is attained by both coils resonating at the same frequency. Current curving within the receiver coil is transformed into direct current (DC) by the receiver circuit, which can then be used to charge the battery on a wireless way. Realizing how this works effectively, this will surely implicate a positive outcome to its users. This will show the following advantages that will be very helpful to wireless charging users. It helps users to charge devices simultaneously. Our current practice of charging is one is to one charging as we require actual and physical charging of charger and device. It wireless charging, since this is transfer of current with no contact, this will help users to charge other several devices, all at one time. It will reduce cost related with maintaining mechanical connectors. As there is no physical charging, it will eventually reduce and eliminate the use of wires and connectors. No need to use those electric wires and chords for charging is just made easy in current transfer only. It makes safe powering or charging of devices that need to remain germ-free or hermetically sealed. As there is no physical contact on chords and charging wires, this will maintain cleanliness and neatness on your phone’s battery. It eradicates sparks and debris associated with wired contacts. As physical charging may have effect on electricity, wireless charging will definitely eliminate this possibility, as no direct electrical charging is being done. In this world full of many changes, this wireless charging will be a very vital improvement in our technology. This is something that everyone may have looked forward before, and now that it is within our environment, this will surely be one that everyone will acknowledge in more years to come.